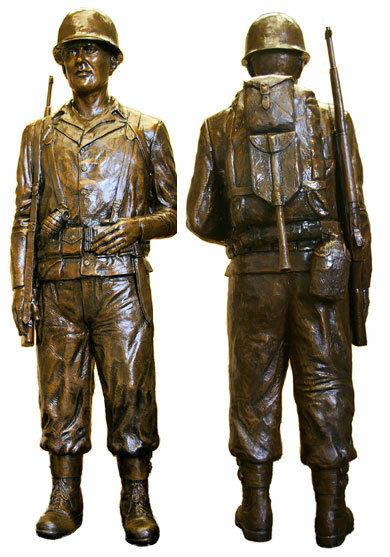 The American bronze GI Statue is dedicated to all those Veterans who served our great country during World War II. It is located in the vicinity of the Veterans, Battle of the Bulge Monument in the area just north of the Powder Museum in Jefferson Barracks Park. The statue was installed in the summer of 2009 and a dedication ceremony was held on Saturday, August 15 (the anniversary of V-J Day). The GI Statue project took two years, five months and 10 days. A special thanks to all who made a donation to the GI Statue fund and those who worked countless hours to help make this project a success! Gateway member Stewart Piper was chairman of the GI Statue project and Dave Schroeder was Fundraising Chairman. The Statue was put in place by the Monumental Finishers on Wednesday, June 10 about 2:00 pm. There were a number of Gateway Chapter members who were present to attend this momentous occasion in the history of the St. Louis Gateway Chapter. Thanks to Robert Bunch and his crew from the Maxim Construction Company for their generous donation of time and construction materials for the walkway and patio where the GI Statue is standing. All those that contributed $25 or more prior to August 1, 2009 are included in the Book of Honor. To make a donation, please make checks payable to Treasurer, St. Louis Gateway Chapter VBOB and send to 9536 Dulles Ct. St. Louis, MO 63123 and mark GI Statue Fund in the memo. The design of the statue is similar to the bronze GI Statue that was erected in 1983 by the people of Luxembourg in the City of Clervaux, as a memorial to the American GI's who liberated their country during World War II. View photo and information of statue located in Clervaux.